I spent this past January in Southeast Asia -- Thailand, Laos and Cambodia -- and was introduced to a green papaya salad that is a staple of the region's cuisine. 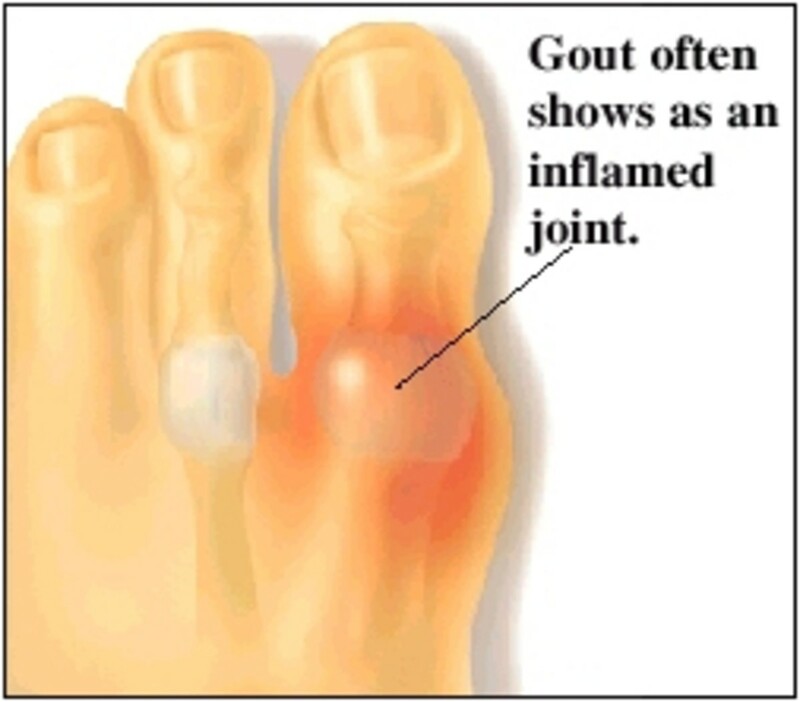 They call it som tum. It is absolutely delicious, and quite addictive. I couldn't get enough of it. I ordered it at many restaurants (almost nightly) and was intrigued by the variety of ways it was prepared. 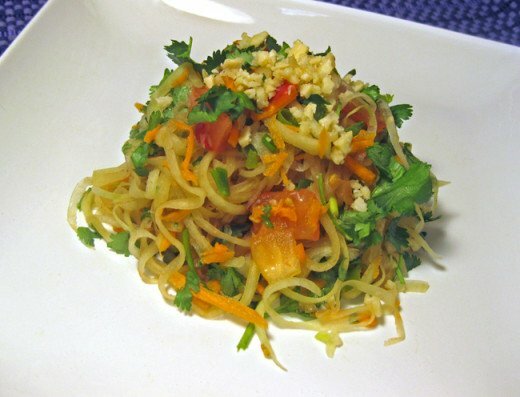 The following recipe makes an incredible green papaya salad. This dish is perfect for vegans. Want to add chicken? It's easy. 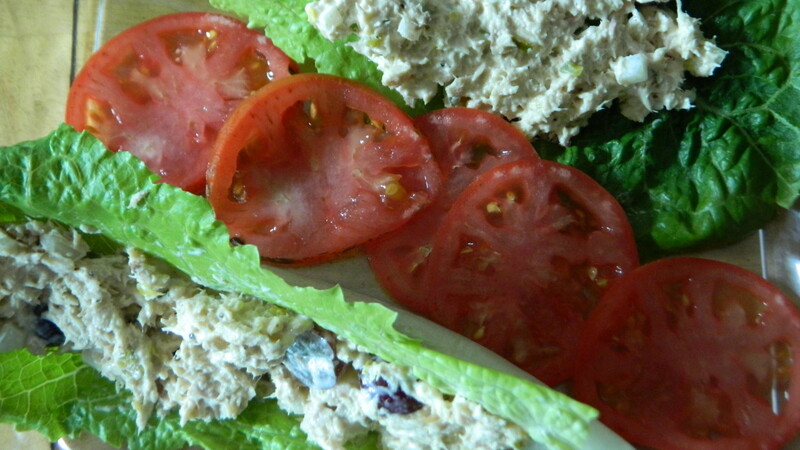 Simply prepare a chicken breast in your favorite way and add it to the top of the salad. 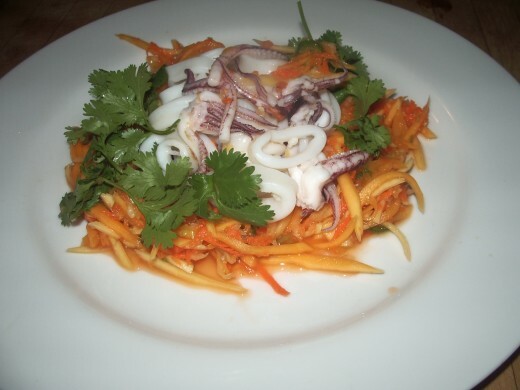 I prefer to add calamari, which is a common way that Green Papaya Salad is served in California. The recipe for how to do it is down below. 2 small hot peppers (Thai peppers, or you can use serrano) omit if you don't like heat! Into a salad bowl, mix the dressing ingredients. I stir it occasionally as I prepare the salad using the directions below. Making it first allows the sugar to dissolve while you make the salad. Using a vegetable peeler, peel off the skin from the green papaya and carrots. Cut off stem ends of green papaya and carrots. Grate the carrots on the large holes of a box grater. Slice the scallions thinly, including the green tops. Finely mince the garlic, then mash into a paste with the side of a knife. If using, slice the small hot peppers into tiny rounds. Add all of the vegetables to the dressing in the bowl, then toss. 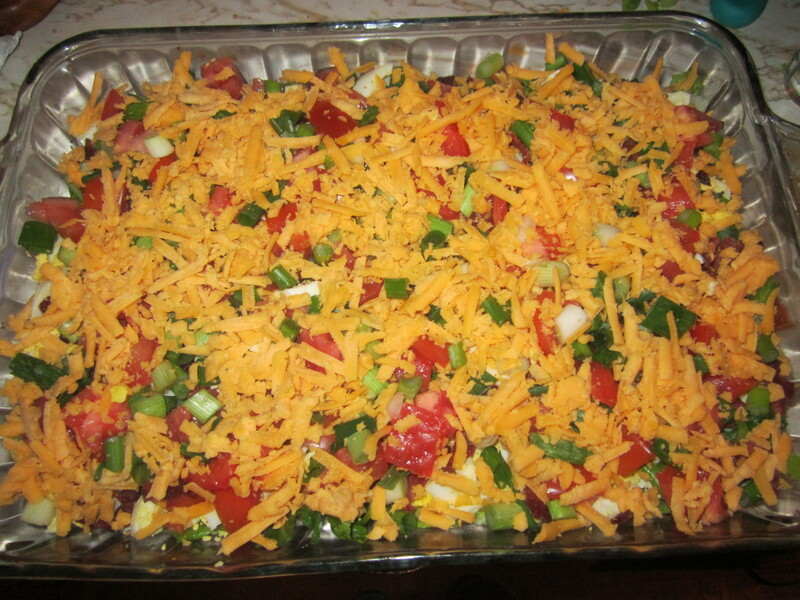 Let the salad sit for about an hour, for the flavors to meld. This resting period is important to creating a fully rounded flavor. Think you don't have enough dressing for the vegetables? Just wait. As the salad sits (I put it in the refrigerator) the dressing will draw out moisture from the vegetables, and you'll soon see lots of liquid in the bottom. Every 15 minutes or so I fold the vegetables and the dressing together. Serve in bowls, garnished with cilantro and cashews. You're going to love this salad! Wash the calamari carefully, including the body tubes and tentacles. 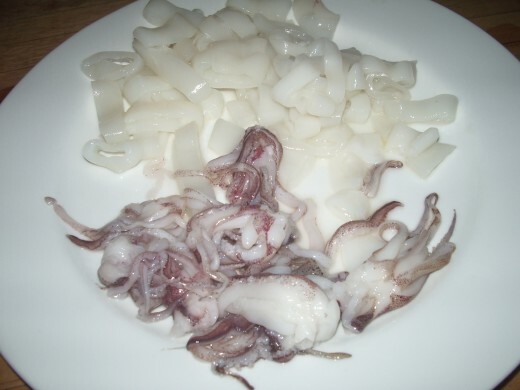 This is what the calamari looks like once it has been cleaned, washed and is ready for poaching. Bring a large pot of salted water to the boil. How much salt? When you taste it, it should taste like the ocean. This means: a lot of salt. Drop the calamari into the boiling brine for approximately 30 seconds. Using a slotted spoon, scoop up the calamari and place on a plate lined with paper towels. Blot away any extra liquid. Reserve two tablespoons of the salad dressing, and toss with the calamari. Add calamari to the top of the salad, and serve. Enjoy! i love som tam but i dont like too spicy hehe !